Who’s Afraid Of Mr Wolfe? 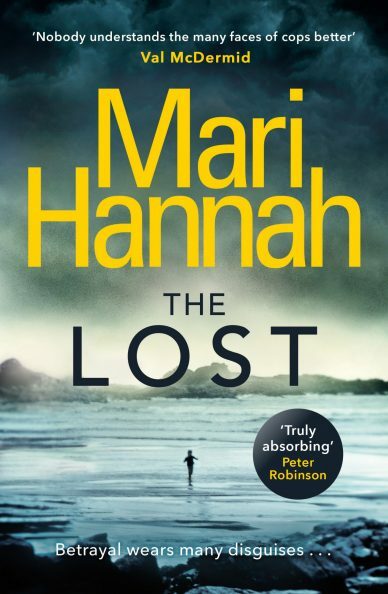 I’m delighted to have scriptwriter and crime writer Mari Hannah on the blog today to talk about her latest book THE LOST. I met Mari when her first book THE MURDER WALL was about to be published and we’ve been friends since, part of a little group in this patch of Northumberland connected by a love of writing and good books, not to mention curry! I’ve watched Mari’s career really take off and I am in awe of how hard she works – not just at her writing, but also at forging positive and supportive relationships with her readers and with other writers. Her awards include the Polari First Book Prize, a Northern Writers’ Award and the CWA Dagger in the Library 2017. 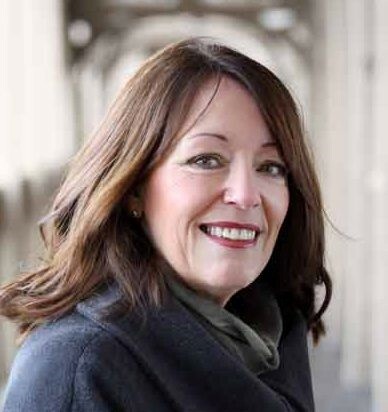 Her acclaimed Kate Daniels’ crime series is in development with Stephen Fry’s production company, Sprout Pictures. Mari is also the reader-in-residence for the Theakston’s Old Peculier Crime Writing Festival, Harrogate. I’m going to hand over to Mari in a minute, but wanted to say that I also asked her if she would be kind enough to suggest some things she’d found helpful as a writer – books, publications, organisations – and I’ve listed them at the end of this piece. At the moment, clicking on a link takes you to a relevant web page … over the weeks I’ll add a piece about all of them to the Writers’ Resources section of this website. Thanks for inviting me over to talk about THE LOST, Hazel. As you know, I recently changed publisher. I’m now with Orion, the home of some of my favourite crime writers. My new editor was keen for me to write something new and THE LOST is the result, my first book featuring Stone and Oliver. These two detectives work for Northumbria Police at Northern Area Command, Middle Engine Lane, Wallsend – aka Middle Earth – where they begin the series in general CID. Detective Inspector David Stone has just arrived in the area from the south. This charismatic loner has fifteen years under his belt in the Metropolitan Police but has taken a demotion and come home to Northumberland where his roots are. His name doesn’t fit his character. He’s no hard man, but a thoughtful, intelligent and compassionate detective doing a job that chips away at his spirit on a daily basis. One incident in particular sits on his shoulder like a heavy weight, a closely guarded secret he’s unwilling to share. His second-in-command is local detective, DS Frankie Oliver. This third-generation enigmatic cop followed her father and grandfather (both Frank) into the job. There has been a Frank Oliver in Northumbria Police since 1966. Having worked in many departments, Frankie has found her niche as a DS in the CID where she’s been for the past two years. She’s ambitious, confident in her abilities, the kind of officer you would not cross, but with a hidden vulnerability. Like Stone, she has a past she’s keeping under wraps. There is a reason Stone and Oliver deny themselves openness. Any sign of weakness is frowned upon within the force. Consequently, their individual experiences act as an ever-present threat that could come back to haunt them at a moment’s notice. These two central characters are set to become a tight and loyal unit. THE LOST begins abroad, then switches to the UK where a child has inexplicably gone missing when his mother is on holiday in Majorca and he’s in the care of his step-father. The book is a psychological thriller, very different from anything I’ve written before. What I love about THE LOST is that Stone and Oliver haven’t worked together long and are just getting to know one another, feeling each other out. I like working with a blank canvas. It’s what makes a book work for a reader whether they know an area or not. As with all my books, this new series is set in and around Newcastle and the dramatic wilderness of Northumberland where I live. It’s a diverse patch that includes a party city that has undergone widespread regeneration in recent years, the windswept Hadrian’s Wall, stunning coastline, villages and market towns, a landscape unchanged for centuries that is as much a character as the locals. Setting makes any book come alive. That’s why I visit locations at different times of the day and night. You can’t pick up smell or sound by looking at a picture on Google. It’s not the same as being there physically. Some of my best plot twists have come from visiting scenes, hearing and experiencing the vibrancy of a place. You need to feel the landscape and listen to what it tells you, including where your main characters live and work. When it comes to crime scenes, a personal visit is a must in order to capture the drama. You can’t work in a vacuum. You have to get out there, otherwise you’re writing blind. The theme of the book is betrayal and how this can and does impact on the lives of those it touches. The idea came to me in a flash. It was one of those ‘what if’ moments, a plotline I played with for a couple of years before I did anything with it. It’s about a married couple – both entrepreneurs – and how their perfect life crumbles when their son disappears. Every series I’ve written has been character driven. Man, woman or child, you have to get inside the head of your characters to explore what they’re going through. It’s the emotional interaction between them that excites me. In the writing process, I’ve inhabited the personalities of a distraught mother, a forlorn teenager, a football coach, a business partner, more than one entrepreneur, a serial philanderer, a sinister figure with murder in mind. The list goes on . . . I hope you will enjoy meeting these two. Happy reading . . . and thanks again for inviting me to your blog. THE LOST is Mari’s ninth book and was published by Orion on March 22, 2018. Book two in the series – THE INSIDER –will follow on Nov 1 this year. Gateshead was where I first lived when I came to the North East and while there have been many changes since, including the arrival of The Sage Gateshead and The Baltic Art Centre, the Shipley Art Gallery was where I used to go to get my ‘fix’ of art … and I still like to call in. I always come away feeling enthused, inspired and impressed. This time I was there to see Grayson Perry’s work, but before I tell you about that, here’s some background about this gem of a gallery. Opened in 1917 with a collection of paintings bequeathed by local solicitor, Joseph Shipley, it now houses over 800 paintings and a collection of works on paper, plus decorative art and contemporary craft. In 1998, its art collections – which include the hugely popular Blaydon Races by William Irving and Christ Washing the Disciples Feet by Tintoretto – were designated as being of national importance and The Shipley is also now established as a national centre for contemporary craft, with one of the best collections outside London. This includes work in wood, metal and glass as well as ceramics. This is where you’ll also find the Henry Rothschild collection of studio ceramics. The Shipley’s five gallery spaces show a range of temporary exhibits through the year. If you want to see what’s possible, what’s experimental, what’s to covet, this is the place. There’s a collection of chairs at the minute that is alone worth a visit. 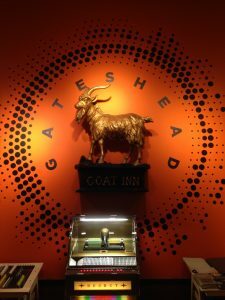 For a taste of the collections, click here and I hope the photo below, taken at an exhibition about Gateshead, gets across the humour and spirit of the place. So, on to the 2003 Turner Prize winner. 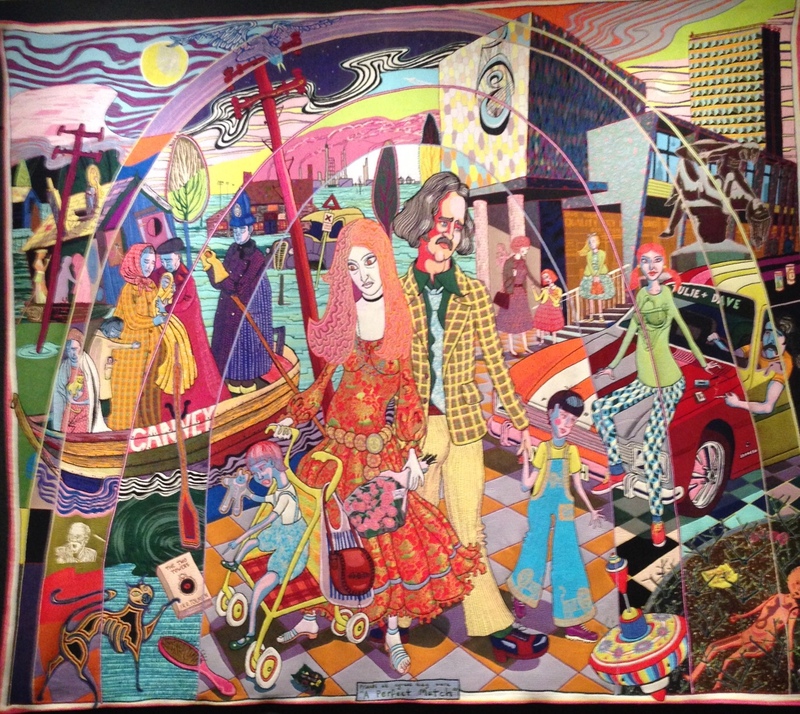 Julie Cope’s Grand Tour: the Story of a Life by Grayson Perry, is a Crafts Council touring exhibition at The Shipley until 28th July. It’s a fantastic opportunity to see two of The Essex House Tapestries: the life of Julie Cope (2015) made for ‘A House for Essex,’ designed by Grayson Perry and FAT Architecture. We normally associate tapestries with grand themes or the celebration of lives more famous than ours, so I loved the way this was turned around. I felt that the result is something that’s almost mythical and Grayson Perry’s mesmeric reading of the narrative seems to underline the poignancy of the pieces. When I wasn’t marvelling at how skilled you have to be to convey something as specific as the swing of a skirt and as huge as the span of a life, I was feeling, well, a bit teary. There are only a few days left to see the tapestries at The Shipley, so get your skates on. You really wouldn’t want to miss them. 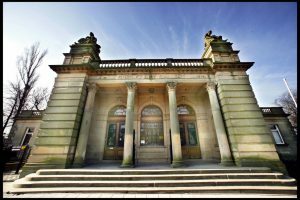 The Shipley Art Gallery is managed by Tyne & Wear Archives & Museums on behalf of Gateshead Council. I love being at home, but need taking out and airing every now and again, or I get restless. So, two trips coming up. 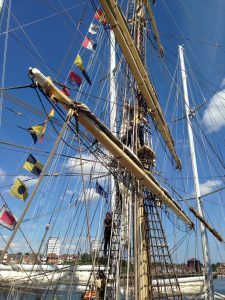 Today it’s about the Tall Ships Race in Sunderland. Tomorrow, the Shipley Art Gallery in Gateshead. This year it was Sunderland’s turn to be the start host port, with 53 ships arriving on the 10th July and leaving on the Saturday 14th. As is the tradition, each host port arranges a programme of social, sporting and cultural activities for crews and visitors and we went along on the last day – a blisteringly hot, not-a-cloud-around one. We had a good look at the ships and watched them glide out of the river to head up the coast for the Parade of Sail. From there they were going first to Esberg in Denmark, then Stavanger and finally Harlingen in the Netherlands. It was obvious from the number of people at the port, on the banks of the river and lining all available look-outs along the coast, that Sunderland had enjoyed having the ships and the ships had enjoyed being there. Huge congratulations to those in charge of organising all the associated events, the transport … everything. A couple of things stick in my mind from the day. The first was the young people of many nationalities playing a game of tag on the Quayside in a jumble of laughter and different languages. 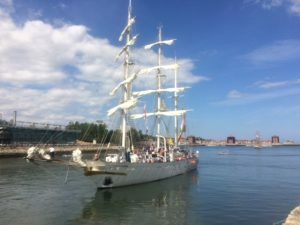 The second happened as the Indian Navy sail training ship Tarangini started to move away from its moorings. Suddenly there was the sound of Indian music and four figures in traditional dress began to dance on the deck in a magical, exuberant goodbye to the crowds.